What's a girl to do when she can't decide between making cake or brownies? She combines them. These bars, you guys. The name alone indicates that they are sure to be delicious, but they really are amazing. A rich chocolate brownie sits between a moist yellow cake and vanilla buttercream frosting. Because the brownie and cake layers bake together, they sort of coalesce during the baking process so that that each bite tastes like a cohesive bite of sweet decadence rather than two separate desserts. I knew that when I first saw this recipe that it would be a winning combination of flavors. These bars satiate even the sweetest tooth, so if you're unsure whether you can handle the intensity of this dessert (it is two desserts in one, after all) then I may suggest foregoing the frosting layer. As the self-proclaimed queen of sweets in my family, I think the frosting adds a fluffy light texture that contrasts well with the rich moist layers below it. And, I just really love frosting. 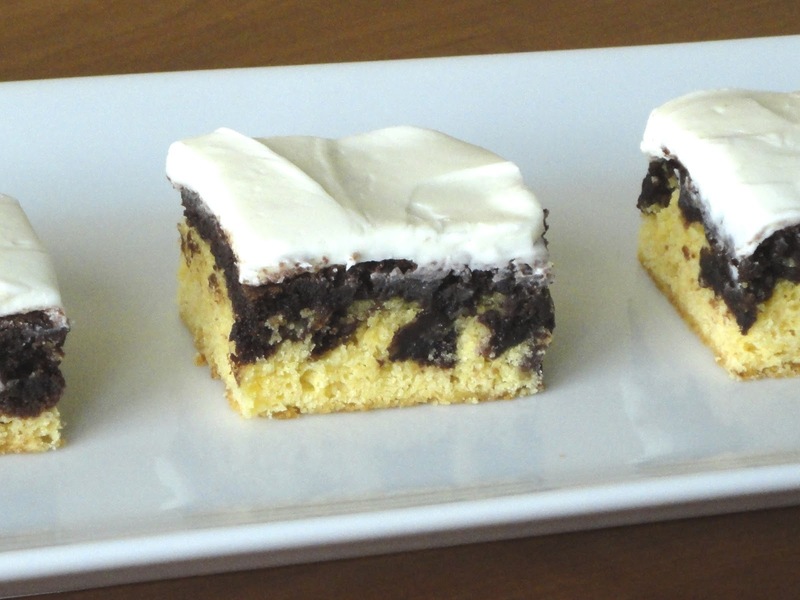 Not only do these bars serve as a special dessert, but they are so easy to make because each layer uses a boxed mix. If you want to impress a crowd or simply looking to treat yourself, then I highly recommend these luscious bars! Looks yummy and easy and much better than the piece of coffee cake I just ate.